That was about the biggest laugh The Simpsons has given me all season. 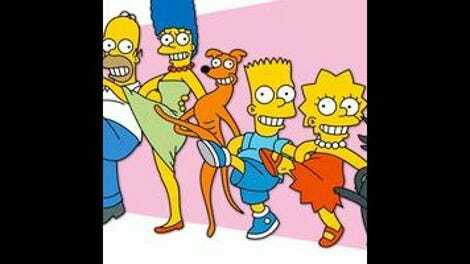 The show has been mean and sick and cruel, but it hasn’t had a lot of Bart’s gleeful subversiveness lately, and it’s a nice change from Homer’s idiocy. 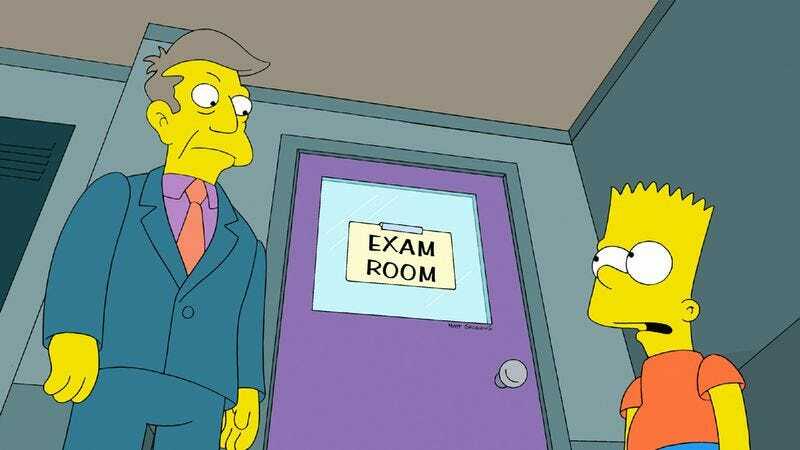 “If you don’t pass this test, it will destroy the school,” Principal Skinner tells Bart – who fantasizes about Springfield Elementary as a fiery ruin, with Skinner hanging from the flagpole (suicide or the result of an angry mob?). Bart finally agrees to put in some effort after another fantasy in which he imagines a future Springfield with an even dumber population than it has now – and a spinach farm, tended by dozens of Popeyes, in place of the school. But he buys time by convincing Skinner to pull the fire alarm and postpone the test. (“Looks like Mr. Vanilla just grew some chocolate chips.” Bart says after Skinner does his bidding.) Bart has some kind of intelligence, as evidenced by the chain-reaction machine he builds out of his toys and schoolbooks to avoid studying, so you can’t help but side with him over the hollowed-out dullards who run his school. The satiric element of “A Test Before Trying” involves the standardized testing craze that’s a big part of current education reform, and we get a nice scene of students furiously trying to fill in those little ovals (no stray marks, please!). Springfield students are especially inept at this. “This student filled in everything except the ovals,” says the astonished proctor of a test that looks like a photographic negative. Fortunately, Lisa gives Bart some multiple-choice strategy – fill in the answers you’re sure of first, then just guess “B” for everything else – that seems to have some validity. If you’re liberal, you can see the episode as a criticism of the “test, test, test” strategy that is often offered as an alternative to better funding of public schools. If you’re a conservative, you can laugh at the incompetence and jadedness of the public school administrators. Bart, no doubt, doesn’t care what you do. In the B-story, Homer finds a parking meter at the dump and lugs it around town to get quarters from motorists who don’t notice that it’s not actually planted in the sidewalk. The most notable aspect of the story is the use of David Bowie’s “Changes” (at least the “ch-ch-ch-ch-change” part) on the soundtrack. Did The Simpsons get an advance tip on Bowie’s surprise new album? The story-before-the-real-story in this episode is about Mr. Burns’ drastic hike in electricity prices. This further drains educational resources, but it’s especially rough for those on life-support systems. Poor Hans Moleman, lying in a hospital bed, croaks, “Do I get a vote?” as Dr. Hibbert and sundry Molemen consider his fate. “That’s just air escaping his lungs,” says his son (I think?) before pulling a switch. I’m from Boston, so when Skinner tells Lisa, “I have an aunt named Hope. Perhaps you’d like to kill her as well,” I first thought he was referring to an ant farm. Naming all the inhabitants of an ant farm does sound like something Skinner would do, right? The no-nonsense, white-and-gray-haired proctor is voiced by Valerie Harper, and I don’t think I’ve ever heard her in such a low register. But her dry delivery is a good contrast to the goofier Principal Skinner (Harry Shearer), and it fits a character who is seen buying a shopping cart’s worth of vodka.